Origin and Habitat: Echinopsis litoralis occurs along the coast north of Valparaiso (Atacama, Coquimbo Regions), Chile. Altitude range: 0-300 metres above sea level. Habitat and ecology: Echinopsis litoralis grows among drought-deciduous scrubs in the coastal regions of the northern part of the mediterranean zone of Chile where it is often the dominant species. Its stems are often covered by lichens. The area is rich in other succulents or stem-succulents, in particular Oxalis bridgesii, Carica chilensis, cacti, in particular, Eriosyce spp., Copiapoa spp., Echinopsis coquimbana, bromeliads Puya venusta, Puya chilensis, Puya beteroniana, of which many are regional endemics. Population analyses indicate that hybridization has occurred between E. chilensis and E. litoralis in the Valparaíso and Santiago coast ranges. Note: The tall and rigid Echinopsis chiloensis and Eulychnia acida – both growing more inland - are replaced near the ocean by Echinopsis litoralis, and Eulychnia castanea that have flexible, creeping, rarely erect stems with almost no rigid wood. The species near the sea-shore must withstand severe storms in winter; survival is increased if the stems are flexible. Erect, stiff trees would be uprooted easily by these storms, which are very common and sink ships almost every year. Description: Echinopsis litoralis (Echinopsis chiloensis ssp. litoralis) in contrast to the typical tall, tree-like Echinopsis chiloensis, is shrubby with several arching or erect cylindrical branches and about shoulder height. Its has much shorter, thinner and flexible spines. Its large, remarkable white flowers 10 cm diameter bloom in the spring, always emerging on the sun-facing, north side of the plant. Derivation of specific name: 'litoralis' Latin, littoral, coastal; for the occurrence in the coast near the ocean. Stems: Cylindrical, less than 2 metres tall, grey to dark green, 10-12 cm in diameter branching from the base. Ribs: ± 20, ' distinct, fairly thin and slightly tuberculate. Areoles: Oblique, yellowish, later grey, up to 1 cm apart. Spines: Yellowish or brownish at first, later grey. Central spines: 2-6, unequal, fairly thick, 1.6-2.4 cm long. Radial spines: 15-29, spreading, thin, awl shaped. Flowers: Solitary, borne laterally near the stem tips, curving somewhat, white to cream-coloured , 12-14 cm long, to 10 cm in diameter. Fruits: Brownish green, 3-4 cm across. 5) Urs Eggli, Leonard E. Newton “Etymological Dictionary of Succulent Plant Names.” Springer, Berlin/Heidelberg 2010. 6) Philip W. Rundel “Population variability in the genus Trichocereus (Cactaceae) in Central chile”. Rundelhttps://www.researchgate.net/publication/248020717_Population_variability_in_the_genus_Trichocereus_Cactaceae_in_Central_Chile [accessed Feb 19, 2016]. . Downloaded on 16 February 2016. 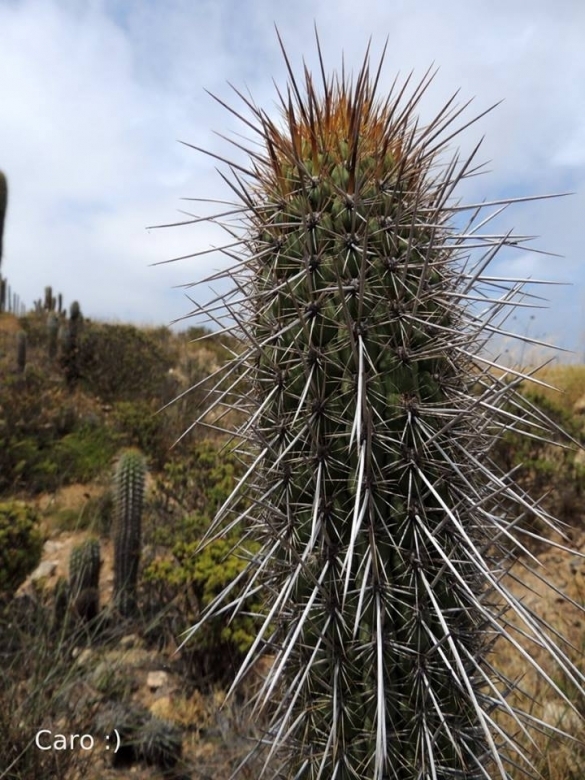 Pest amd diseases: They are susceptible to fungal diseases if overwatered, but are not nearly as sensitive as many other cacti, especially in warm weather. They tend characteristically towards black rotted spots unless watering is moderate and only in hot weather, if kept damp through cold periods, they will invariably suffer. Growth rate: Echinopsis litoralis produces noticeable amounts of growth each year if kept well fed and watered throughout the warmest months, particularly if it has been acclimatised to accept full sun. Once this cactus is established it can easily produce 20 cm of growth every year.